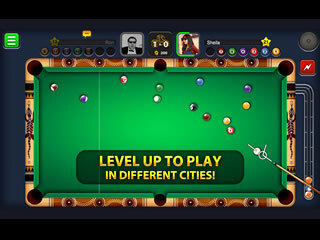 8 Ball Pool is a great game for you device because you can play and work on your pool skills not only for the virtual game but also for the real pool game with your friends. The game is not really something special being one of the many pool games for your devices. The graphics are really bright and sharp despite many details. You can chose to play one-on-one matches or with 8 players. You can challenge your friends through Facebook to play with you too. 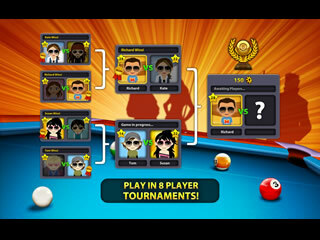 The game is quite user friendly and is easy to figure out even for those who do not play pool in real life. As for those who do know what pool is all about, there are some extra options. You can adjust your moves with the help of the trajectory lives that are shown to you as you point to a particular ball. Then you adjust the level of power that you want to hit with. You are gives only 30 seconds for a shot which helps keep the game going and adds an extra challenge. You are to play several rounds. There's a fee for each game. If you win you get your money back plus your opponent's. As you play you get experience points that help you level up. This happens whether you win or lose. This is also helpful when you chose whom to play with since you can kind of judge about a person's skills level. There's nothing to distract you from pool playing, so you can dive into the game and master the tricks.